Alberta Health Services has confirmed that a measles case has been confirmed in Lethbridge. The Lethbridge Herald has reproduced the report. Alberta Health Services has confirmed a case of measles in the Lethbridge-area, and is advising of potential exposures. AHS is in process of contacting unimmunized individuals who have been identified as immediate contacts. Symptoms of measles include fever, cough, runny nose or red eyes, and a red blotchy rash that appears three to seven days after fever starts. The rash typically begins behind the ears and on the face, spreading down to the body, and finally to the arms and legs. The article advises those with symptoms to avoid other people and to call Healthlink Alberta 1-866-408-LINK (5465) or their doctor as soon as they can. And then there were EIGHT! According to this report, that one case is now 8 cases among members of an extended family! … SYMPTOMS OF MEASLES INCLUDE FEVER, COUGH, RUNNY NOSE OR RED EYES AND A RED BLOTCHY RASH THAT APPEARS THREE TO SEVEN DAYS AFTER FEVER STARTS. THE RASH TYPICALLY BEGINS BEHIND THE EARS AND ON THE FACE, SPREADING DOWN TO THE BODY, AND FINALLY TO THE ARMS AND LEGS. This comes shortly after local health officials warned that immunization rates in the area are too low, something this blog reported on here. 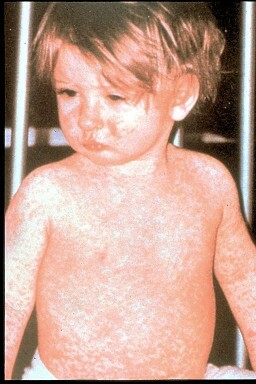 Measles is incurable but it is preventable. Unfortunately the anti-vaccine movement has convinced many people that vaccines are ineffective and more dangerous than the diseases they seek to prevent. How bad is measles? According to the College of Physicians of Philadelphia (bold in quote added). Measles can lead to complications ranging in severity from diarrhea to encephalitis (swelling of the brain), with adult patients typically being subject to more severe complications. Although the disease is rarely fatal in developed countries, the death rate can be quite high in underdeveloped nations. Case-fatality rates have been recorded as high as 28%, and tend to rise during wars or widespread food shortages. As recently as 2000, measles caused 1.1 million deaths globally among young children in a year’s time. On Thursday the chairman of the Chiropractic Board of Australia said it had removed some courses from its approved training schedule and would be randomly auditing practitioners to ensure they were not making unsubstantiated claims about the benefits of chiropractic. It also announced all registered chiropractors would be required to remove anti-vaccination claims from their websites. The major concerns are that nosodes can divert people from traditional vaccination campaigns, give people a false sense of security and hasten the spread of infectious disease, such as measles or whooping cough. It’s a serious public-health issue, given that falling vaccination rates have led to outbreaks of disease in Canada and other countries where the illnesses have previously been under control. Much of the fear over vaccines can be traced to the work of now-disgraced Dr. Andrew Wakefield, who falsely reported that the measles-mumps-rubella vaccine is linked to autism. For more on the fight against Nosodes go to Stop Nosodes‘s site. Flu vaccine call for volunteer help. Immunize BC has some good information and some great posters, etc. to help spread the word, including the little badge just above. Childrens Hospital of Eastern Ontario offers some good reasons why children should be vaccinated. Public Health Agency of Canada’s site is a goldmine of good information. The graph below is taken from their site. Dan Johnson has also started a Facebook group: Pro-vaccination Alberta.